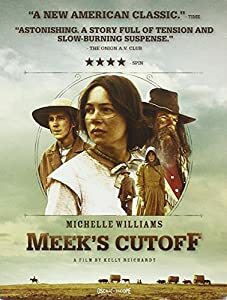 If it were not for the fact that Meek's Cutoff has two of my favorite actors (Michelle Williams and Paul Dano), I would have found the film beyond redemption. I find that if you have certain actors in film, you can endure so much. Such is the case with Meek's Cutoff. You always sense that there is a great story somewhere in there, and you have good performances in it, but somehow you just think like the pioneers in the movie: 'when are going to get there'. On their way to Oregon, a small group of pioneers are crossing the American frontier. They are being led by Stephen Meek (Bruce Greenwood), a mountain man who claims to know a shortcut. Needless to say, the shortcut seems longer than the set route would have been, and our group of pioneers become lost. They wander, and wander, and wander. Water supplies are running low, while tempers and fears are rising. 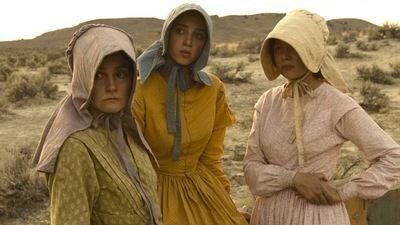 While pioneer women like Millie (Zoe Kazan) and Emily (Williams) look on with growing paranoia and cool anger respectively, their husbands Solomon (Will Patton) and Thomas (Dano) cannot seem to decide to dump Meek (basically kill him) or keep going with him, hoping that he does indeed know the way. The White family, father William (Neal Huff), daughter Glory (Shirley Henderson) and young Jimmy (Tommy Nelson) keep to themselves for the most part. As they keep going and going, hoping to make the Columbia River, the party comes across a wandering native (Rod Rondeux), billed as the Indian. While Meek would rather just kill the Indian, Solomon and Thomas believe he might know where there is water, so they keep him alive. Soon, the party starts following the Indian, but whether they are following him to get water or following him into their destruction we do not know. Millie is convinced that the Indian means to do them harm, while Emily believes the danger comes more from Meek than from the Indian. Finally, Solomon is the one who falls ill, and Meek reluctantly begins to take orders from the strong-willed Emily. The Indian walks away, while Emily looks on. As I think on Meek's Cutoff, I think both the positive and negative aspects of the film come from Kelly Reichardt's pacing. On the one hand, she captures the monotony of the pioneer experience as they made their way across the American frontier to the Pacific. On the other hand, said monotony soon starts dragging the film to where you wonder when anything will happen. Credit should be given to how well the emptiness of the prairie and desert of the unconquered West were visualized in Christopher Blauvelt's cinematography, but so much of Meek's Cutoff involved this group just march on and on and on. Now, that might have been part of the point in Meek's Cutoff: to show how our ancestors trudged onward, and we could accept that. What was becoming more difficult to bear was how we really never got to know the characters. Does it matter why they were going to Oregon? Does it matter how they managed to get mixed up with Meek? Do they as individuals actually matter? My sense is that the answer is no. The point of watching stories such as Meek's Cutoff is to gain an emotional involvement with the characters on the screen. For most of the movie, we weren't even sure how they all connected with each other. We never got a firm answer as to whether Meek was deliberately leading them into disaster, was sincerely but wrong or was just an idiot. Jon Raymond's script never appears interested in answering any of these questions or trying to figure the motivations of any of the characters, from Emily to Meek to the Indian. We're always presented with situations but never get a definitive resolution to them. For example, the Indian leaves marks on rocks along the way. Is this a way to signal to his nation where they are headed as Millie fears, or just a way to express his religion as Solomon believes. Solomon and Thomas don't appear to trust Meek as the journey continues, but they never appear to want to make a decision one way or another to either commit or dump him. Does the Indian care about Solomon's death (since he performed some sort of death rite only he understood) or just wants to live? Given the fact that Meek's Cutoff is an hour and forty-four minutes, one gets the sense that it is truly far longer because again, so little appears to actually happen to any of them save the journey. I will give Reichardt credit where she deserves it: she gets good performances out of her small cast. Emily's strength comes through, as does the insecurity of both Thomas and Solomon and Millie's growing sense of fear about their situation. Nelson's Jimmy showed how a child would find a character like Meek, with his wild hair and rather dirty demeanor, fascinating. Again, I go to Blauvelt's beautiful camera work: early in Meek's Cutoff, we see a transition to where we first imagine a ghost rider in the sky only to find that what we are seeing is the travellers going through the plains. Reichardt, who also serves as editor, brought sequences like that flawlessly, and all those are enhanced by Jeff Grace's sparse but elegant score. I get the sense that Meek's Cutoff will try many viewer's patience. First, the film is intolerably slow. Second, we don't get to know any of the characters or their motives particularly well. Third, the film is intolerably slow. Fourth, Meek's Cutoff really doesn't have a beginning or an end: we jump in when the group is already lost, and we just end the film with the Indian walking away, so we don't know whatever happened to any of them. That it is based on history does not absolve the film from either lacking in catharsis or from being intolerably slow. On the positive side, it is as close to an accurate portrayal of what crossing the frontier would have been like as we're likely to have. We also have both Williams and Dano, two fine actors, in the film, and a chance to see them on the screen is always a welcome one. Those, however, are small comforts to how intolerably slow Meek's Cutoff is. The fact that I was so looking forward to it because of Williams, Dano, and the subject matter makes it all the more frustrating.